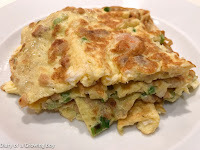 Omelette with preserved radish and minced pork (菜脯蛋) - very classic and simple dish. 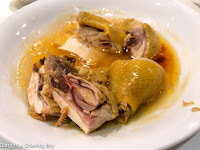 Clay pot with mutton brisket (羊腩煲) - seasonal winter dish. The chunks of lamb with the skin and fat were pretty nice. The leaner parts were OK. 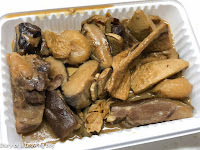 Served with tofu skin (腐竹), plenty of shiitake mushrooms (椎茸), and water chestnuts. Very heavy flavors, and tons of MSG. Once again I forgot to take a picture... so we've got a picture of the dish after packing into a plastic box for takeaway. Not a fair sample to judge whether this place is star-worthy, but I suspect even on a good day, this could never hope to beat Seventh Son (家全七福) or even Fook Lam Moon (福臨門).